Read all of Mark 2, starting with the last verse of chapter 1 for context. What are the common themes in the stories that are grouped together in this chapter? Read Verses 1-12 as if you were one of the crowd. With who did you come to this house and why? What are you feeling and what are you thinking as the events of the story progress: As Jesus is preaching to you and others? As you see the 4 men arrive carrying the paralysed man? When Jesus forgives the man’s sins? When Jesus explains why he forgave? When the man gets up and walks past you? Read this section again, as if you were a teacher of the law. With who did you come to this house and why? What are you feeling and what are you thinking as the events of the story progress: As Jesus is preaching to you and others? As you see the 4 men arrive with the paralysed man? When Jesus forgives the man’s sins? When Jesus explains why he forgave? When the man gets up and walks past you? Read this section again, as if you were one of the men carrying the paralysed man. Why did you come? What are you feeling and what are you thinking as the events of the story progress: As you arrive with the paralysed man? When you decided to go through the roof? When Jesus forgives the man’s sins? When Jesus explains why he forgave? When the man gets up and walks past you? Read this section again, as if you were the paralysed man. With whom did you come to this house? Why did you come? What are you feeling and what are you thinking as the events of the story progress: As you arrive? When you are being let down through the roof? When Jesus forgives your sins? When Jesus explains why he forgave? When you get up and walk out past the people? Read this section again, identifying with Jesus. What are you feeling and what are you thinking as the events of the story progress: As you see the people arrive? As you are preaching initially to the crowd? 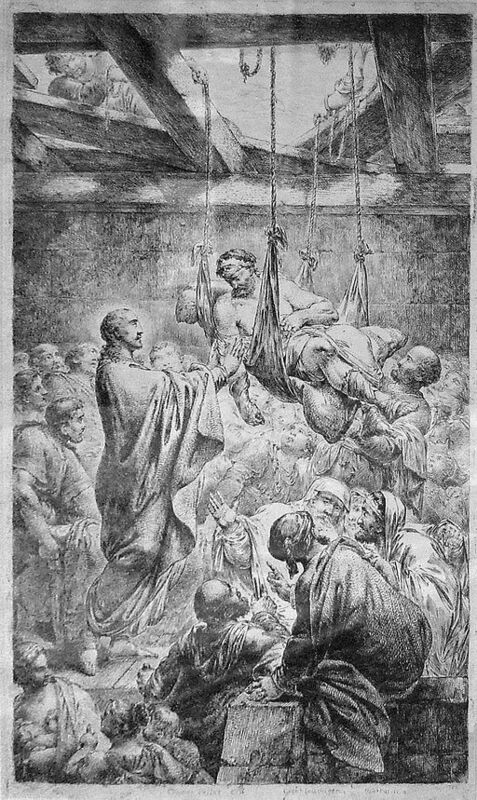 As you see the paralysed man being lowered down in front of you? When you look into his eyes and see his paralysed legs? When you forgive the man’s sins? When you know in your spirit what the teachers of the law are thinking? When you tell the man to get up and he walks away? When the crowd is amazed and praising God? How might you respond to God now? If you can, take a walk or do another physical activity that allows your mind to simply be present with the story, listening and letting it speak into your life.